This blog series has been dedicated to introducing you to the concept of Stewardship. Stewardship, as I have explained before, takes on many forms: time, family, faith, talent, prayer and treasure. In my last post, I described stewardship as it relates to talent. 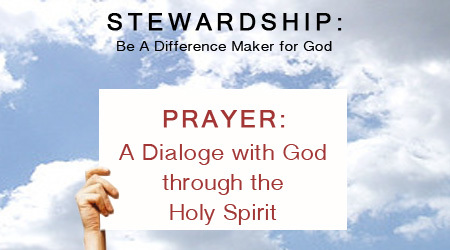 In this post, we will explore the concept of Stewardship as it relates to prayer. When we devote time to prayer, we deepen our relationship with God and become better prepared to offer ourselves in service to God and others. Many people approach prayer as a tool to use only when they want or need something from God. The prayer often sounds like, “Lord, help me through this problem and I will do X, Y and/or Z for you.” This becomes somewhat transactional and is the way that I found myself praying in the past. When I took a deep look into the way in which I approached prayer, I realized that I was not humbling myself before God, but simply trying to process a business transaction. The past several years have just been mind-numbing with change in our communities, our country and overseas as well. We have been bombarded with WikiLeaks, stock market ups and downs, record level unemployment, a housing crisis, threats from North Korea and Iran, and political turmoil in the USA. However, as we navigate through all of this, we still find one part of our lives that has remained constant —God’s love for us. Regardless of issues we face or turmoil we navigate, we all have been blessed with a God who loves us. We should also be grateful to God that we have shelter, food, and clean water to drink. In addition, we have family and coworkers who love us. Another aspect of Prayer that I shamefully admit that I have only recently learned is the opportunity for us to do a self-reflection of what is in our heart. I mean, I had heard of the concept, and embraced it superficially, just lightly reflecting on it, but never really made it something that I was going after with tenacity and vigor. I have had the blessing of being coached by some incredible prayer warriors who have instilled in me the importance of searching areas of my heart that I have yet to release to God. Places of sin, despair, worry and lack of faith. This takes time to do, and it is actually fairly upsetting when you consciously outline to yourself the areas you have left to let go to God. It’s not easy. It takes humility and the willingness to release any amount of control thinking, but it is the most rewarding and liberating aspect of being a fully devoted follower of Christ. When I pray, do I thank God more than I ask God for a deal? Do I reflect and give thanks before every meal, regardless of circumstance or location? What can I do for God and the advancement of His Kingdom? Do I believe that everything I have is a gift from God? Is prayer simply a task on my schedule that can be postponed or canceled? Am I willing to make a commitment to prioritize prayer? Do I believe that prayer consists simply of words and phrases, or do I believe that it impacts my relationship with God? Have I considered inviting friends or family to join me in prayer? Therefore, my challenge for you is this: Do you know what you are thankful for? And are you willing to thank God for all He has done for us, even in the face of all the adversity we experience? What are you thankful for? We would love to know. Please share your thoughts here with our community of readers.